They exchanged pleasantries and parted ways. It was obvious the two of them had no real desire to keep up with each other and that they were just being polite for etiquette’s sake. We were all glad when it was over. It didn’t take much for my brain to leap forward 24 years and imagine myself in her position, shopping at the same Albertson’s with my own children in tow, casually running into one of the mean kids who called me names and harassed me all year long when I was 14. At the time I couldn’t imagine anything worse. My fear of ending up in the same unhappy environment I grew up in became the driving force in shaping my personality for the next several years. I was fiercely ambitious and completely focused on doing well in school. Learning to prepare and cook food didn’t register as anywhere near necessary, let alone important enough to take up space in my overly intellectual brain. Clearly I had “better” things to do. It took a massive overhaul of my world view––one so big I changed careers––for me to take chopping an onion or roasting a chicken seriously. In retrospect my college life would have been much easier, and I may not have gained so much weight those first two years (25 lbs), had I known how to cook. More important, my transition to becoming a foodist would have been far less difficult had I not been starting from scratch in the kitchen. As with most new habits, the no.1 limiting factor in creating change was my own mind. More specifically, the limiting beliefs I had about myself and my identity that prevented me from taking a positive action to make my life better. If I’m completely honest with myself, there was a time I thought I was too good for cooking. Obviously this is ridiculous and far from true, but at the time it prevented me from making cooking a priority or even trying something new. Even more ridiculous is that I was proud of being so block-headed. Will someone please go back in time and smack me with a spatula? Limiting beliefs come from within, but they are shaped by the world around us. For instance, had I grown up in a culture that put more value on home cooking, say in France or Italy, I probably would not have belittled it so much in my mind. Is it surprising that it was during my year studying abroad in Italy when I finally learned how to work a stove? I don’t think so. Typically there is some benefit of holding onto a limiting belief in the beginning. In my case, distancing myself from my mother and my hometown encouraged me to be an excellent student, ultimately awarding me two prestigious degrees. Not too shabby. The trouble comes when we start limiting ourselves too broadly, in realms where the beliefs are no longer useful and can even cause harm to ourselves or those around us. My belief that I needed to focus exclusively on my career meant that I also believed spending time on domestic tasks was a waste of time. I took the positive value of a strong work ethic and projected it too far, letting it keep me from trying things that could drastically improved my life. In this way limiting beliefs hold us back in ways we don’t even realize. How does this apply to you? We all have limiting beliefs that prevent us from making positive changes in our lives. Maybe you believe you can’t take care of your own health because you need to give your children and family all of your attention. Maybe you believe you can’t exercise because you hate running on the dreadmill. 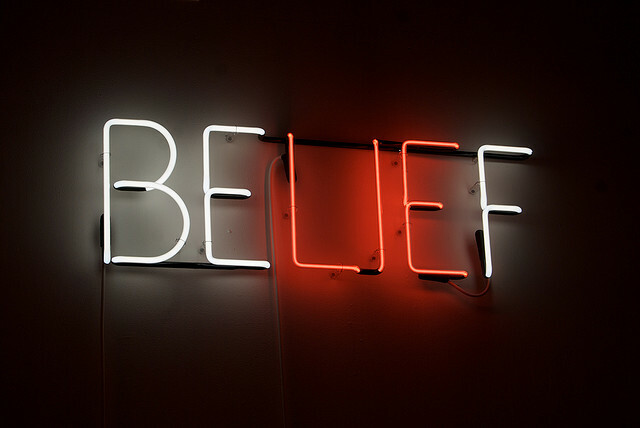 A limiting belief typically manifests as a vague sense of discomfort or defensiveness around a topic. What I’ve learned is that if I have a broad, sweeping reason I can’t do something instead of concrete, specific reasons, then there’s a good chance I’m being held back by a limiting belief. Recognizing your limiting beliefs can be hard, but you can get better at it with practice. For instance, if you say you can’t cook dinner at night because you’re “just way too busy,” I’d wager that a limiting belief is preventing you from even trying. One reason for this may be that you haven’t practiced cooking much, so every time you try it is frustrating and takes a substantial amount of time, as is true of anything that you’re learning for the first time. Another possibility is that you can cook, but are accustomed to choosing complicated recipes that require many different components and lots of attention to detail. You’re actually just too tired at the end of the day for that kind of effort. In one case you tell yourself you don’t have time, when you actually just haven’t acquired the skills. In the other you believe all cooking needs to be complex and time-consuming. In both cases knowing a few simple cooking techniques, having a weekend shopping habit, and a handful of Home Court Recipes would solve the problem. If you get past the limiting belief, you can go about tackling these much simpler, more practical concerns. Instead of having to move mountains to find an extra hour in your day, in a few weeks you’ll be able to walk in the door after work and whip something up in under 30 minutes. Recognizing your limiting beliefs helps you turn a seemingly insurmountable problem into a smaller, more manageable challenge you can actually handle. There are creative solutions to almost all simple problems, but you have to be willing to consider them. Can you recognize a limiting belief you have now or have held in the past. How has it served you and how might you be applying it too broadly in your life now? Modified from the original published September 15, 2014.